The Atlanta BeltLine is the most comprehensive economic development effort ever undertaken in the City of Atlanta and, at an estimated $2.8 billion, is among the largest redevelopment projects currently underway in the United States. The project will provide a network of public parks, multi-use trails and rail transit along an old, abandoned 22-mile railroad corridor that circles the downtown area and connects 45 neighborhoods. One of the first of the new Atlanta BeltLine parks to be completed is the Historic Fourth Ward Park, a 30-acre greenspace stretching from North Avenue to Freedom Parkway. The centerpiece of the new park is a two-acre storm water retention pond, which not only solves some of the historic flooding problems in that area, but also cost $15 million less than a planned storm water relief tunnel. The pond also features photovoltaic solar panels to reduce energy consumption from Atlanta’s grid. This new park offers a grand recreational space for the people of Atlanta. 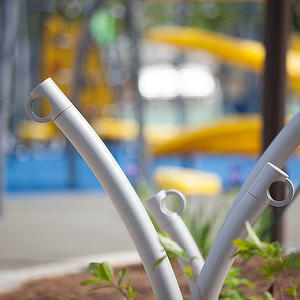 In addition to the scenic storm water pond, the park features elegant walkways, waterfalls, a playground, a splashpad, a multi-use field, and a skatepark. Forms+Surfaces was introduced to the project when a representative from the BeltLine project stopped by our booth at the ASLA Expo in 2009, and said he was very interested in our products. We eventually were put in touch with Wood & Partners, a landscape architecture firm from Tallahassee involved in the design of the new park. 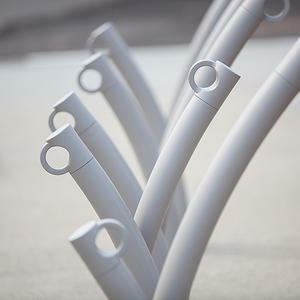 They specified 120 of our Bike Garden Bike Racks, which have been installed in sculptural groupings throughout the park. 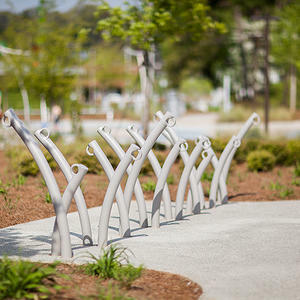 Unlike anything else on the market, the Bike Garden is comprised of individual "stems" in six heights that allow you to create project-specific layouts while providing multiple locking points and secure bike parking. 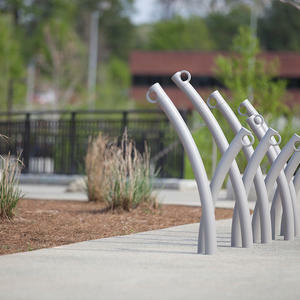 We are excited to be a part of this historic project, and to have our fresh, functional Bike Gardens available for cyclists in the park. 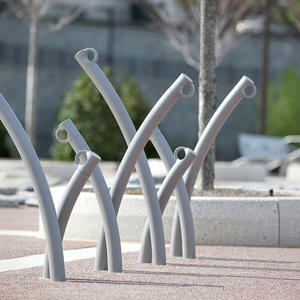 If you are interested in learning more about our Bike Garden Bike Racks, visit our product page or contact us.